A smolt wheel, also known as a Rotary Screw Trap (RST) is designed to catch a portion of the spring time juvenile salmon who are migrating out to the sea for the first time. Any salmon which swim into the smolt wheel are held, unharmed, within its ‘live-well’ until technicians arrive to sample them. Data such as length and weight is collected from all the salmon caught, as well as scale and tissue samples from a proportion of them. 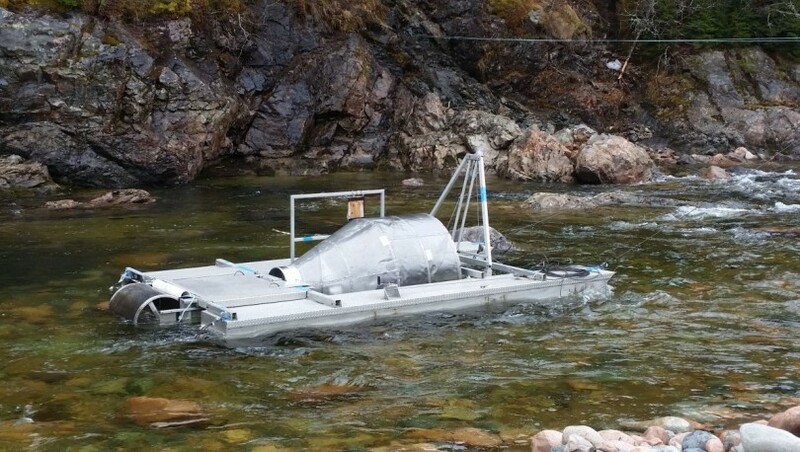 A percentage of those fish captured from the Big Salmon River (BSR) wheel are held for transport to the Live Gene Bank (LGB) at the Mactaquac Biodiversity Facility (MBF) where representation of surviving iBoF Atlantic salmon families are being maintained. In recent years, the captured salmon on the BSR are tagged with a punch hole to the mid-upper caudal fin and recycled upriver to be recaptured by the smolt wheel once again. This helps determine the percentage of the run that the smolt wheel is catching, which allows us to estimate the size of the overall run. Fort Folly, with the support of the New Brunswick Wildlife Trust Fund, has been monitoring the smolt run on the Big Salmon River since 2002. This important work provides essential information to DFO scientists allowing them to adaptively manage their recovery approaches & LGB support of this endangered Atlantic salmon population. The project also enables the capture of wild exposed smolt that are brought back to the MBF to replenish brood stock. Capturing smolt that have grown up in the river helps the LGB program guard against domestication caused by living in a hatchery environment. Another important advantage of collecting wild exposed smolt is that it may cause us to capture rare families that could improve the genetic diversity within the LGB mating plan. Field sampling via an RST was completed for the season of 2016. The RST or “smolt wheel” was installed in the Amateur Pool of the BSR, located approximately 500 meters above the head-of-tide. The smolt wheel was installed on April 28th and began fishing on May 1st, 2016 and was raised for the season on June 14th with removal on June 16th, 2016. 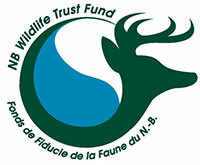 The RST was operated by FFHR with assistance from the Mi’kmaw Conservation Group (MCG) with fishing occurring 7 days a week from May 1st until June 14th, 2015. The total RST smolt catch was 1,328. The assessment of origin, wild versus hatchery, of out migrating smolts carried out by field technicians is done by making note of the presence/ absence of the adipose fin. Hatchery reared juveniles released as un-fed fry would still have their adipose fins present where as hatchery reared juveniles released as fall fingerlings would have their adipose fins clipped. In the field, many smolts identified as wild would actually have been released from the hatchery as un-fed fry (with adipose fin intact) in previous years. Through genetic analysis of tissue samples taken during processing, DFO can differentiate between smolt resultant from LGB fry releases and those resultant from wild spawning. The number of wild smolt, as determined by the presence of their adipose fin, captured in the RST in 2016 was 1,328. The number of hatchery origin smolt, as determined by the absence of an adipose fin, captured in the RST was 0. The total number of smolt marked and recycled for the mark/recapture experiment was 678. Of those 678 marked fish, 90 were recaptured. Two out of every five ‘wild’ smolt captured in the RST were sampled and retained in a live box prior to being transported to the Mactaquac Biodiversity Facility (MBF) for incorporation into the LGB program. The wild smolt were sampled for tissue, scale, length, weight and were implanted with a Passive Integrated Transponder or PIT tag. With a protocol to collect 2 of 5 smolt and a total number of 1328 wild salmon, a total of 513 iBoF Atlantic salmon smolts were collected, sampled, tagged and retained for inclusion into the LGB program. With an initial target collection number of BSR smolts of 300 we were successful at not only meeting but exceeding this target with 513 retained for inclusion into the LGB for 2016.